Epiphone SG Bully with DragonFire Active Pickups! Epiphone SG BUlly with DragonFire Active Pickups. Well I was thinking about trying some active pickups. I bought some DragonFire Active Pickups, here is the review! Installed into a black Epiphone SG. KIller! Thick, sweet, deep, heavy, fat, wicked. Lower mIdrange boosted. Well seeing as how it takes at least a monh for reviews to get posted in the reviews section of Harmony Central, I will post my review here and submit there as well (copy/paste). I play bluesy hard rock, metallish and a lil thrashy here and there. More on the melodic, slower stuff. But I like playing fast as well. Influences include Sabbath, Kiss, Boston, Steve Miller, Maiden, Rhoads, etc. I bought the DragonFire Active Pickups kit that comes with both PUP's and the stereo jack, battery clip, springs and screws (no pickup rings, though). You get all that for $80. Guitar heads has what I believe are the same pups as this for 80 as well, that comes with the mounting rings also. But the guitarheads comes with their logo on the front of the pups, and I don't like the look of it, kinda cheesey. If GH used initials or something, a smaller font maybe it would be ok. So DragonFire it was. I ordered them online, they got here within a few days. I had 2 different guitars I was considering putting this in. Firstly, it was an Epiphone SG BUlly that I got off craigslist for $15.00. It was missing a neck pickup, bridge, stop bar, and the back cover. Everything else was there. So I got the bridge parts from guitar fetish. The other guitar is a Floyd Rose DST-2, it had stock humbuckers in it at the time. It was kind of a flat sounding guitar, being a cheap chinese basswood guitar. I was going to put a Fat PAT in the Floyd git, because it's supposed to have some low end and good high. But later decided to put the actives in it cause it has a floyd rose. I thought would be more metal-like. Well being the newbie at modding guitars that I am, it was adventurous. I kept having to pull the pickguard off the floyd git to check my wiring and fix little things. I got fed up and decided the SG would be easier for troubleshooting wiring issues from the back plate. So yeah I put the DF actives in the SG. Sounds quite tight, I must say. I agree with most reviews of the dragonfire actives that these are more the lower mid range and kind of bassy. Not real bad, though. There are some highs in there as well. Thing is, I like LP and fat sounds, so bassy is not too bad for me (like Black Sabbath bassy). UPDATE: They are not too bassy actually they are fine. More lower mid actually. I do disagree with people saying these are not good for leads, they are still good for leads, lots of sustain. Sounds nice with distortion, wah, etc. Good attack. Nice harmonics, etc. The only problem is I'm playing thru a crappy little squire amp and a BOSS digital multi-effects pedal. I also have a little behringer modeling amp. But both my amps are basically kind crappy. See, I didn't really pay a whole lot of attention to what people said about active not really being optimal for solid state (especially little amp that is like $60 brand new). I do now agree that is true. I need to get a nice amp so I can really appreciate these (and the rest of my pups). At first (I thought) the neck pickup sucked, but it was way low, I raised it ALL THE WAY, and that made it sound good. Both are raised all the way, it seems to work fine that way. I will check later when I can play louder then I could tonight. BUt I know the neck one for sure sounds alot better up high. It did not make them noisy or bassy (or bassier) raising them up. I have to say, it is a sweet deal, though. You get 2 active pickups for the same price as 2 GFS passives. Wow, hard to beat. I do recomend trying these as well as other dragonfire pickups. This SG does NOW sound better then the stock SG Bully PUP did in the SG(although that is a good, high output PUP, which is ALSO kind of bassy, the stocker kind of muddy). Yep, it looks killer with the black DF's, the SG is also black. It has a chrome bridge, and now I wish I would have went with all black. Black on black is sweet. The only reason I went with chrome, is the tuners were chrome and I was not sure if I was going to be keeping this guitar, and wanted to keep my options open. But now I really like the SG with these PUPs. 3-21-2009: Wow I just got done playing the SG again a few minutes ago just now. It sounded sweet! The CLEAN tone even sounds pretty good on these; yes you have to roll back on your volume to get it to sound good clean, but hey that is ok. THey are still versatile enough if you don't mind doing that. But I was pretty suprised that they sounded that good clean. So I am very pleased with the DF Actives, and will certainly entertain the idea of purchasing some of their other pickups. Their passive pickups are only $20 each. Update 3-23-2009: So I played them a bit today in the SG. I really like the way these sound; it's very thick sounding because it's strong in the low mids. Much like black sabbath sounding but more modernized. I think modernized black sabbath is a really good way to describe the sound you get with these dragonfire active pickups when played thru effects; distortion, flanger, phaser, delay, octive (no not all at once :). For me, this works out great because I actually like Tony Iommi's tone. And old sabbath was some of the very first things I learned to play on my first electric; Sweetleaf, NIB, Iron Man. I guess you could say these pickups have a sound closer to the Dio days in Sabbath; a bit more modern sounding. Yes I love these pickups for a budget Iommi SG setup. It's a dream come true. If you need a pickup that is trebly; I do NOT recomend this pickup. If you want trebly actives EMG is the way to go. 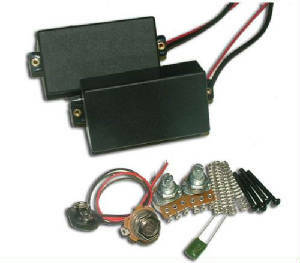 If you want a high output passive that is trebly; consider BIll Lawrencve L-500XL, or if on a budget, get DragonFire Rails pickups. UPDATE 3-25-2009: Yes these do sound WICKED! THis is a super-killer budget Iommi Epi SG! These pickups sound VERY Black Sabbath like IMO. Lovin' it. Great bang for your buck, a little more high end on the tone would have gotten them a 9 or 10! 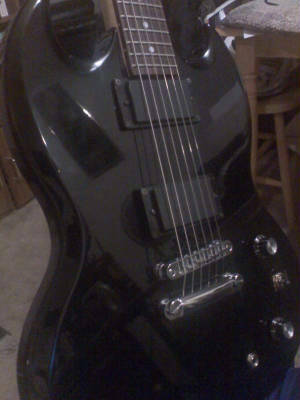 Here is a link to my Epiphone SG Bully with Active Pickups Photo Album, where the BIG PICS are!